Obesity is increasing in incidence in the community. Now approximately 50 per cent of women who become pregnant are overweight. Being excessively overweight has considerable implications for a pregnant woman. It is one of the most important and most difficult challenges during pregnancy and childbirth care. Body mass index (BMI) is the index used medically to establish whether or not someone is of an appropriate weight for their height. You can check your BMI at the National Heart Foundation of Australia website. Being of considerable excessive size (BMI ≥ 40) (called ‘morbid obesity’) is associated with an increased incidence of subfertility and miscarriage. As well, there is an increased risk in pregnancy of diabetes, pre-eclampsia, thrombosis, sleep apnoea, excessive growth of the baby (called ‘macrosomia’) and maternal death. Ultrasound imaging of the baby in the uterus and monitoring of the baby’s growth and wellbeing with ultrasound scans is much more difficult because of the likelihood of poor quality imaging, which is a direct consequence of the excess adipose (fat) tissue in the abdominal wall. There is an increased incidence of induction of labour, prolonged labour, operative delivery (both operative vaginal delivery and Caesarean section), shoulder dystocia (baby’s head is delivered but baby’s shoulders are stuck) and postpartum haemorrhage (excess bleeding after delivery). As well, there are greater difficulties with getting a good signal with external baby heart-rate monitoring in labour because of the excess adipose tissue in the abdominal wall and so an electrode passed through the dilating cervix and attached to the baby’s scalp (called a ‘scalp electrode’) is usually needed to get a good foetal heart-rate pattern recording. Excessively overweight patients tend to be less mobile in labour and so there are greater demands on midwifery staff to manage and position a very large woman in labour. Both operative vaginal delivery and Caesarean section delivery are technically more difficult and dangerous and extra measures need to be taken to facilitate the delivery and try to minimise the risk to mother and baby. Anaesthetics for labour and delivery are more difficult in the very obese patient. An excessively obese patient usually has considerable adipose tissue in her back and so the anaesthetist may not be able to feel/locate the spinous processes of the vertebral bones, which are the landmarks used for positioning the epidural/spinal block needle in the intervertebral space. 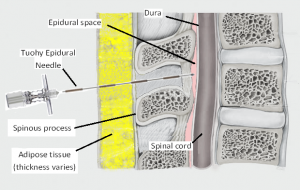 Also, if there is too much adipose tissue in the back the epidural/spinal needle may not be long enough and so it is technically not possible to reach the depth of the epidural space with the longest needle. Also, some people have significant scoliosis (sideways curve to their spine), which means their spine midline is displaced laterally. If this can’t be recognised (because excessive adipose tissue prevents identifying the spinous processes of the vertebral bones), not only will the epidural/spinal needle not be inserted in the correct place, but the attempt at doing an epidural/spinal block is extremely dangerous. Some obstetric anaesthetists can use ultrasound scanning of the back to help locate the spinous processes of the vertebral bones and so can locate the intervertebral spaces even when the spinous processes cannot be palpated. This increases the likelihood of a successful epidural/spinal block and reduces the risk. While all anaesthetists should be able to successfully provide an epidural/spinal block in a normal sized woman, only a minority have the skills to do this in a morbidly obese woman. So, if a senior, appropriately trained, obstetric anaesthetist is not available (as is often the case during out-of-business hours) then it is likely that an excessively obese woman will not be able to have an epidural in labour or a spinal anaesthetic for an emergency Caesarean section delivery. After delivery, there can be delayed wound healing, increased rate of wound infection, greater likelihood of needing support with breastfeeding establishment, and a higher incidence of postnatal depression. Long-term neonatal consequences include your baby having a body composition with more fat cells, excessive infant weight gain, and the considerable likelihood of your baby having obesity in infancy and beyond, and throughout life having all the obesity-associated physical and psychological consequences. Many women are unaware of the risks and management challenges of being pregnant and excessively overweight. Many are not aware of recommendations of weight gain in pregnancy. Many gain more weight in pregnancy than is recommended because of a poor diet. Many don’t know what constitutes a poor diet and what constitutes a good diet. Many are not aware that if they gain excessive weight in pregnancy they may find it very difficult to lose the extra kilos afterwards and so have a weight after pregnancy that is considerably more than it was before the pregnancy. This increases the risks in future pregnancies. Don’t try to lose weight while pregnant. Rather focus on not having an excessive weight gain in pregnancy. The normal pregnancy weight gain is 10–12 kg. Focus on eating healthy food and limit your portion sizes. Exercise regularly while pregnant with activities that are considered not dangerous. If you have a BMI ≥ 40 and you are booked for delivery at Norwest Private Hospital, I will arrange for you to see one of four senior anaesthetists who have had extra training in providing epidural blocks to overweight women. This consultation will be at about 30-weeks’ pregnancy. The anaesthetist will assess your possible epidural extra considerations and ways of optimising your likelihood of having a successful epidural if that becomes your preference. You are not committing to an epidural anaesthetic at this visit, but rather increasing your likelihood of having a successful epidural in labour should you decide. If you have a BMI ≥ 40 and are booked for delivery at the San Hospital, I will discuss your condition with an anaesthetist who has a special interest in obstetric anaesthetics and is especially skilled in a doing epidurals in excessively overweight women. Try to reduce your weight to an optimal level before conceiving. Obesity is now at an unprecedented high incidence in the community and is an increasing problem. Being overweight was much less common in past generations in the western world and is much less common today in communities in the world that do not have western diets. The problem is largely due to the nature of food and drinks most popularly ingested by an increasing number of people and the size of the portions. There is both ease of access and clever, nutritionally misleading advertising of the fast food, junk food and soft drink companies to contend with. As well, it is very hard to buy healthy food in supermarkets today. Food and drink manufacturers have added so many unhealthy chemicals and other additives (such as sugar) to their products, to entice you to buy their products and to want more of them. Food advertising in the media and labelling is usually misleading and often gives the public a false impression that that product is of nutritional value when it is not and that by consuming it you are having a healthy diet. You need to start with the premise that the agenda of the companies that make food and beverage products is to do whatever they can to get you to buy their products and that most cannot be believed or trusted. You need to take responsibility for your health and know what is in the food you are eating and drinking, and whether it is good for you, without relying on information from manufacturers’ advertising and labelling. You need to develop a level of expertise in nutrition and how to read ingredients, etc. There is a huge amount of good information on the internet. You will need to be able to filter it so you don’t believe someone’s drivel. Try to have more fresh produce that you prepare yourself. To say that you are too busy and so only have time for fast food will be to detriment of your health. Fad diets don’t work. It needs to be a lifestyle change, not a diet. After all, it has been your present lifestyle that got you to the weight you are now. The obesity problem is also due to people being less active than in the past. But, if you want to lose weight, you will do so by focussing on a diet with exercise rather than exercise alone. Some overweight patients tell me “I have always been overweight and I have tried to lose weight over the years”. If your mother was overweight then you are more likely to have chemical modification of your genetic makeup (called ‘epigenetics’) that predisposes you to being overweight. As well, you are more predisposed if your mother put on excessive weight in her pregnancy with you and/or you were given the wrong types and possibly excessive portions of food/drink when in infancy and childhood. As well, people have different metabolic rates. You may have a slower metabolism, which will predispose you to gain weight more easily than someone with a faster metabolism. With consideration of epigenetics, the chemical modification of your genetic makeup that predisposes you and your children and grandchildren to being overweight, the future can be changed by you if you can win the battle and have an optimal weight. 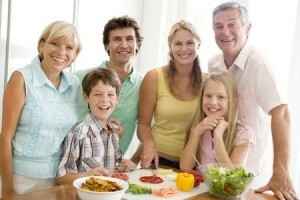 By doing so, you are helping to protect your children and your grandchildren from having an obesity problem. It is important that you win this battle not only for your own health’s sake but also for the sake of the health of your children and future generations. Your baby will prefer your music and your food!